WSH130 is designed to integrate Hall sensor with output driver together on the same chip, it is suitable for speed measurement, revolution counting, positioning, and DC brushless motors. It includes a temperature compensated voltage regulator, a differential amplifier, a Hysteresis controller and a open-collector output driver capable of sinking up to 20mA current load. An on-chip protection resistor is implemented to prevent reverse power fault. The temperature-dependent bias increases the supply voltage of the hall plates and adjusts the switching points to the decreasing induction of magnets at higher temperatures. 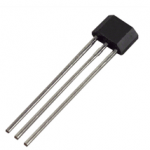 Subsequently, the output can keep switching on/off on more preciseswitch point regardless to the ambient temperature. WSH130 are rated for operation over temperature range from –40˚ C to 125 ˚C and voltage ranges from 2.4V to 26V. 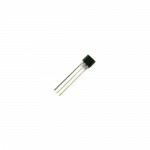 WSH49E Linear Hall Effect SensorThe WSH49E integrates Hall sensing element, linear amplifer, sensiti..
WSH135 Hall Effect SensorThe W135 integrates Hall sensing element, linear amplifer, sensitivity cont..